In my never ending quest to keep up with my sourdough starter, I found this recipe on the King Arthur Flour site. They made a cake with a frosting and a drizzle. I made cupcakes and used my quick, fudge frosting to ice them. 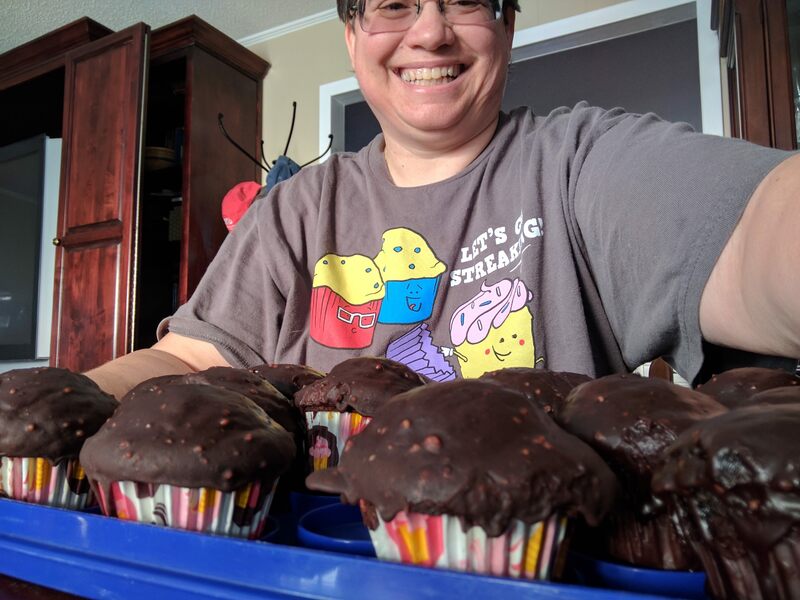 Wearing a “Let’s Go Streaking” cupcake t-shirt! Feed your starter and remove one cup. Combine the fed starter, milk and flour in a large mixing bowl. Cover and let rest at room temperature for 2 to 3 hours. It will expand a little bit. Preheat the oven to 350°F. Fill 2 muffin tins with cupcake liners. In the bowl of a stand mixer, beat together the sugar, oil, vanilla, salt, baking soda, cocoa and espresso powder. Add the eggs one at a time, beating well after each addition. Gently combine the chocolate mixture with the starter-flour-milk mixture and beat gently until smooth. Pour the batter into the prepared liners. Bake the cupcakes for 30 minutes, rotating pan midway through baking. Bake until a cake tester inserted into the center comes out clean. Remove from the oven and set it on a rack to cool for 5 minutes before removing from the pan. Once entirely cool, frost generously. In a saucepan, combine butter, cocoa, and milk; bring to a boil. Add sugar and vanilla; beat well until smooth. Place in the refrigerator to cool before using. If frosting becomes too stiff, add 1 drop of milk at a time until it reaches the desired frosting consistency. My friend Beth gave me this recipe and it is rather delicious. I did cut the butter and Worcestershire sauce amounts down a bit (but not too much). 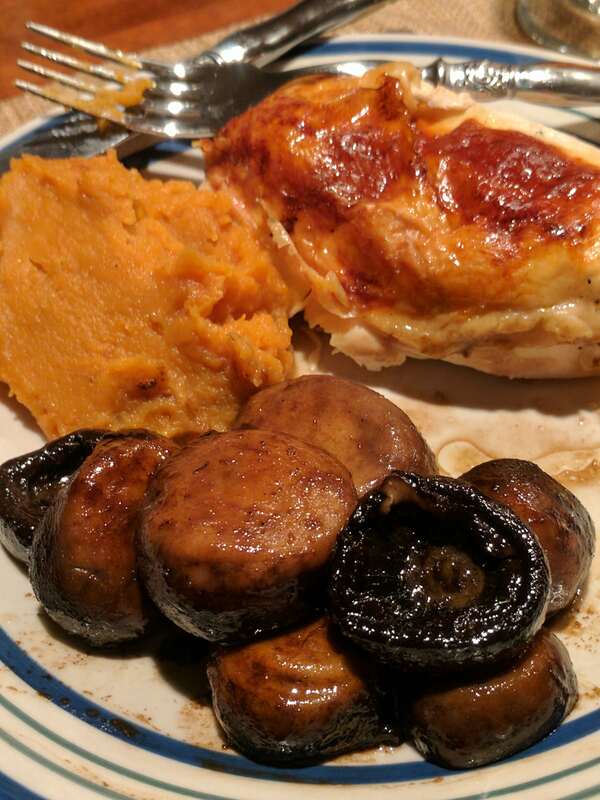 I served them with roast chicken and mashed sweet potatoes for a tasty, tasty dinner. Toss mushrooms in melted butter. Add the rest of the ingredients and stir to combine. Simmer, covered for 20 minutes. I’ve been looking for inventive ways to use my sourdough starter. 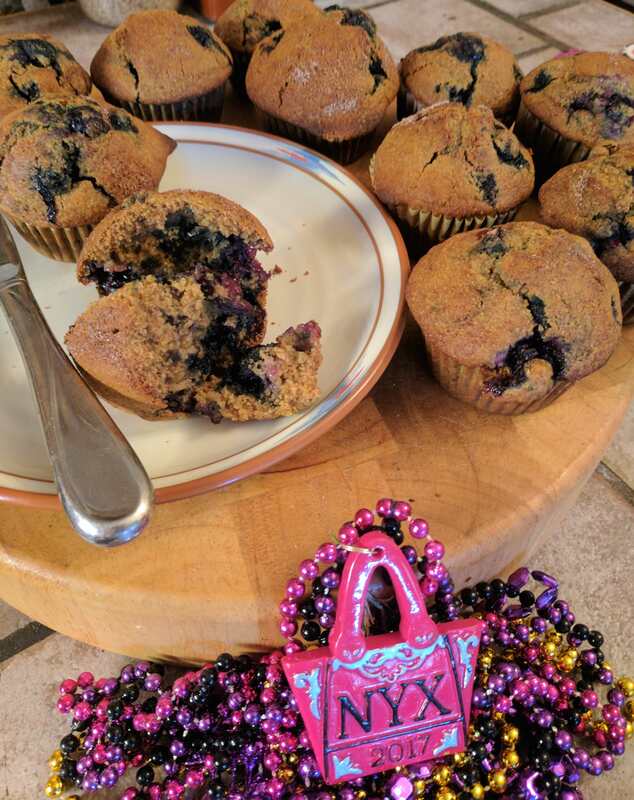 After scanning the King Arthur Flour website on sourdough, I found these blueberry muffins. I made a few adjustments which I’ve put in below. Being a southerner, maple syrup was a non-starter, so I switched to cane syrup, available in many grocery stores or online. I also coated the top with cinnamon sugar (mix half cup sugar with 2 tablespoons cinnamon). I was using big blueberries from a you-pick farm, so I dropped that amount slightly (do use the full two cups if using grocery sized blueberries). The resulting muffins are hearty without being heavy. They are lightly sweet with a burst of blueberry in every bite. I’m posting them with some of the beads from the Krewe of Nyx parade last night. Preheat the oven to 425°F. Line a 12-cup muffin pan with papers and lightly spray the inside of the papers with oil. Whisk together all the dry ingredients in a mixing bowl. In a second bowl, beat together the sourdough starter, milk, egg, melted butter and sweetener. Blend the wet ingredients with the dry until the batter just comes together. Gently stir in the blueberries until blended. Fill the cups of the prepared pan with the batter; sprinkle the tops of the muffins with cinnamon sugar. Bake the muffins for 25 minutes or until a toothpick inserted in the center comes out clean. Remove the pan from the oven and allow the muffins to cool for 5 minutes before removing them from the pan. 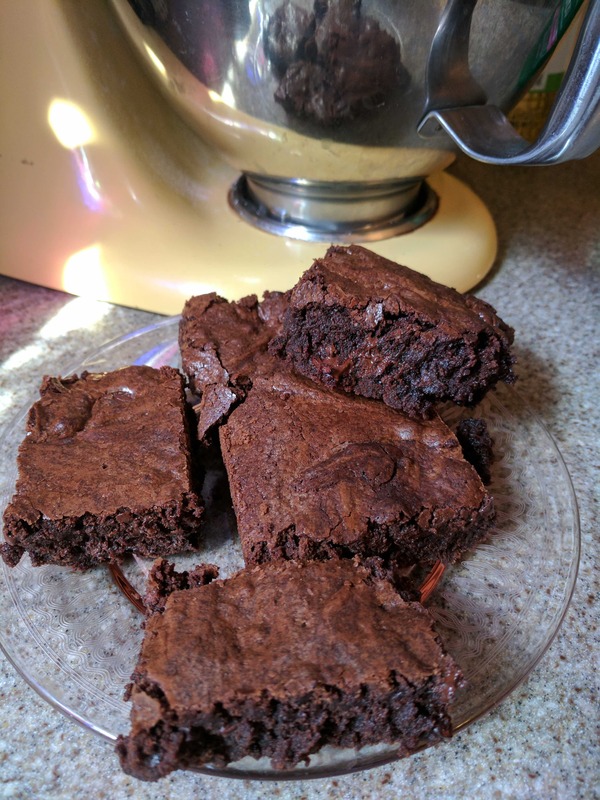 I woke up craving chocolate, so I started these brownies. They are mixed in a large double boiler, so there isn’t a lot of cleanup. Oh, and they get better as they sit (they are very gooey when first taken out of the oven but firm up with time) as the chocolate gets even more intense the next day. In a large double boiler or in a large bowl over a saucepan with some water in it, melt the butter with the unsweetened chocolate over low heat, stirring occasionally. When smooth and melted, sprinkle on cocoa powder and whisk to combine. Remove the pan from heat and allow to cool slightly. Using a hand mixer, mix in sugar and vanilla. Add eggs, one at a time. Reducing mixer speed to low, mix in the flour. Add the chocolate chips and cacoa nibs and stir just until combined. Pour the very thick batter into a buttered 8 x 8 or 9 x 13 baking pan (a square pan will result in thicker brownies). Smooth the top and place in the oven. Bake for 40 minutes, then check the brownies with a toothpick. If it is overly gooey/messy, return to the oven for 5 to 10 more minutes. Don’t leave them in there until the toothpick comes out clean, though, as that would be too long. Allow to cool completely before cutting into small squares. The brownies are very rich! It is that time of the month and I’m craving chocolate and cake. But mainly chocolate. 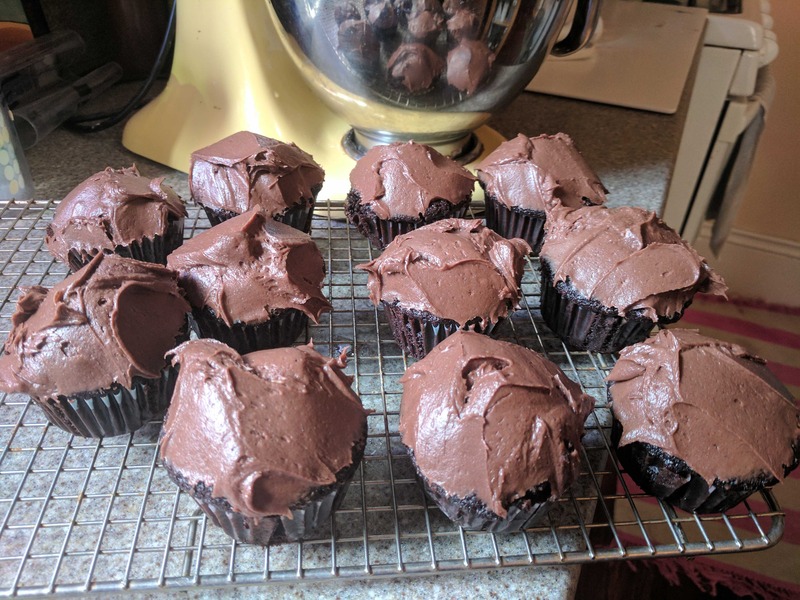 These cupcakes have the chocolate kicked up – first, by making a slurry of cocoa powder, bittersweet chocolate and coffee you get an intense taste of chocolate. The recipe also calls for bread flour as its added gluten development means more chocolate can be added than in a cupcake with all-purpose or cake flour (hat tip to America’s Test Kitchen for that trick). For even more flavor, I added cacao nibs to the cupcake batter and used Creme de Cacao instead of vanilla in the frosting. Place cocoa and chopped chocolate in a heatproof bowl. Pour coffee over and let stand 5 minutes before whisking. Mix until smooth and set aside to cool. Sift together the flour, salt and baking soda. Stir in sugar. In the bowl of a stand mixer, combine cooled chocolate, vegetable oil and eggs over medium low speed. Add in vinegar and vanilla and mix well. Add in the flour sugar mixture and beat until smooth. Stir in cacao nibs, if using. Divide batter evenly among the prepared cupcake liners. Bake for 18 to 20 minutes, or until a toothpick inserted in the center comes out clean. Allow to cool in pan for 10 minutes. Remove from pan and cool completely before frosting, about one hour. Sift together cocoa powder and powdered sugar – this step is important as it gets rid of any lumps in the sugar. Combine the butter and cream cheese in a stand mixer and mix until smooth. Reduce the speed to low and add in the cocoa and powdered sugar. Add Creme de Cacao and mix well. Frost cupcakes. This recipe can easily frost 18 cupcakes, so you can be very generous with the 12 of the above recipe. A lovely side dish to accompany the Apple Cider Roasted Chicken recipe I posted yesterday. You want to make sure you have equal amounts of sweet potato and apple and to make a smaller dice than you see in the picture. In a large bowl, add the sweet potatoes, drizzle with olive oil and sprinkle with salt. Toss to coat and arrange them on a baking sheet. Roast the sweet potatoes until they are soft but not mushy, about 10 to 15 minutes. Remove from the oven and reserve. Add the bacon to a large skillet and place over medium heat. When the bacon has started to get crispy and brown, add the onions, season with salt and sauté until the onions are translucent and aromatic. Add the apples and sauté for about 10 minutes or until they soften. Stir in the sweet potatoes and the cinnamon and sugar. Sauté until the sweet potatoes are cooked through and starting to become crispy, about 7 to 8 minutes. Taste for seasonings. This chicken is tangy and sweet and stays nice and juicy because of the brine. The recipe is adapted from a dish served at 3 Squares Café in Vergennes, Vermont. 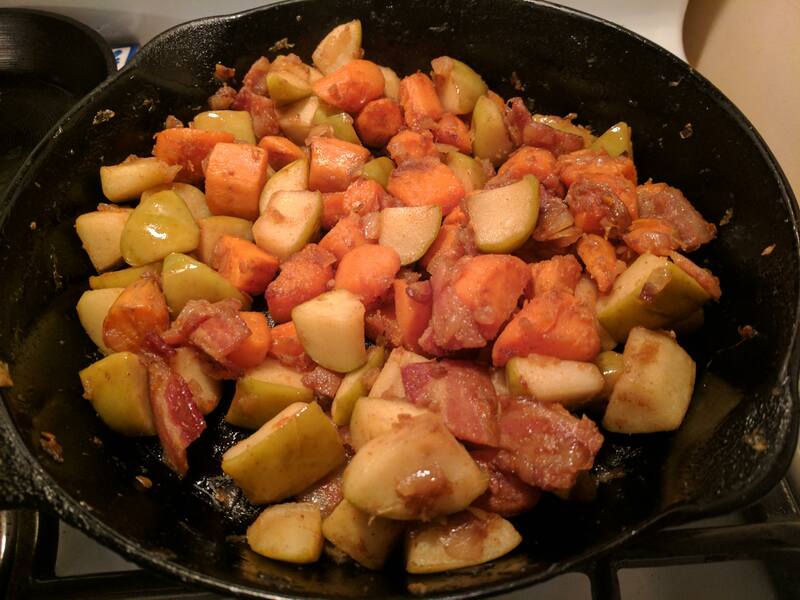 I served it with a side dish of apples, bacon and sweet potato that I’ll post tomorrow. In a large pot (big enough to hold 10lbs of chicken), combine cider, salt, peppercorns, garlic, honey and rosemary and bring to a boil. Remove from heat and let steep for 5 minutes. Stir in ice cubes and cold water. Place chicken pieces snugly in the the pot with the cooled brine to cover completely. Set a plate on top to keep the chicken under the surface of the brine. Set in refrigerator for at least 6 hours and up to 12. Do not over brine, as this can make the chicken too salty. Remove chicken from brine and pat chicken dry with paper towel. Place on baking racks over a rimmed baking sheet and refrigerate uncovered, for at least an hour and as long as 4. When ready to roast chicken, preheat oven to 400 degrees F. Pat chicken pieces dry once again with paper towel. Coat chicken skin lightly with olive oil and arrange them in a large roasting pan. 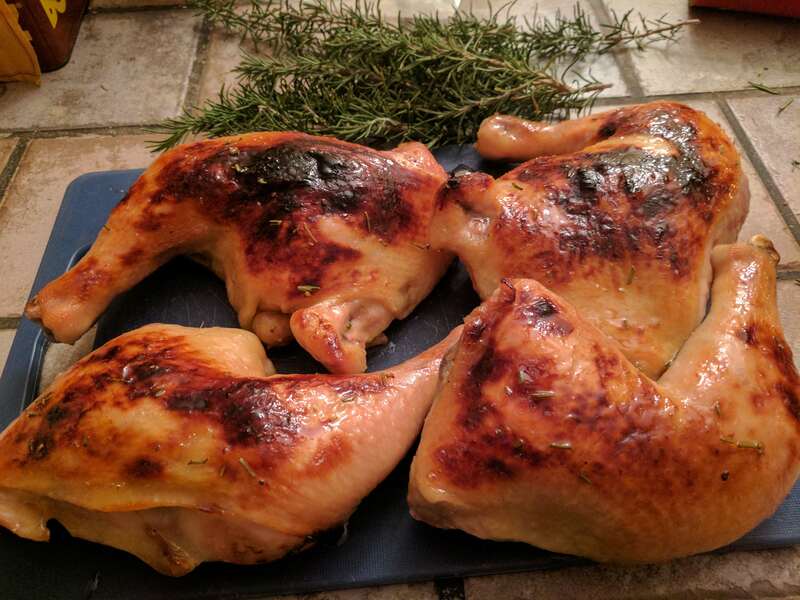 Roast chicken for 30-45 minutes or until light golden brown. While chicken is roasting, in a small pan, whisk together honey and apple cider vinegar and then add chopped rosemary. Bring to a simmer over medium heat and cook, at a gentle simmer, until reduced in volume by about one-half and is lightly syrupy, such that it clings to a pastry brush but is still liquid enough to brush, about 10 minutes. Remove chicken from oven and turn oven to broil with oven rack in position such that chicken will be about 3 inches from element. Brush chicken generously with glaze and return to oven for up to 5 minutes until skin is dark golden brown. Watch carefully. Serve chicken drizzled with more glaze.